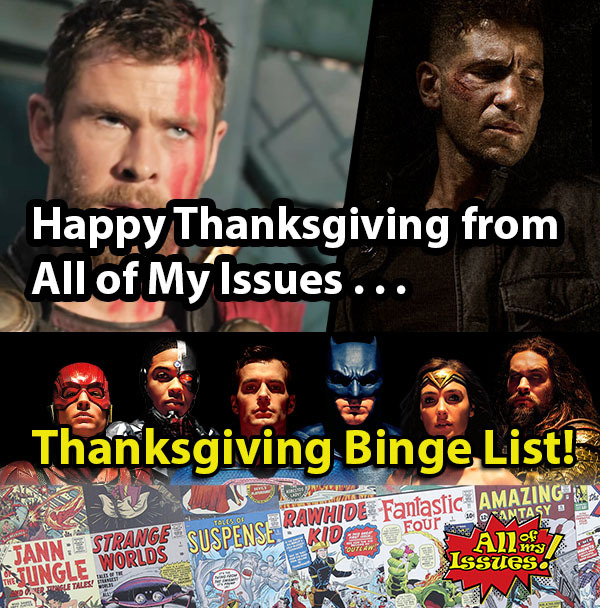 Things to Binge this Holiday Weekend – All of My Issues! It’s Thanksgiving! One of our favorite holidays. The day America decided to make competitive eating a holiday…and there’s the whole finding reasons to be thankful also. After you’ve listened to Adam Sandler’s Turkey song for the 100th time, you will likely want to fill your holiday weekend with some much deserved binge watching. The only problem now is what should you watch. Well, we here at AoMI have the solution for you. We’ve selected a list of recently released media to point your eyes and ears at. This is a new series that has just been released that is based on the highly successful Marvel comic series. You will need to have a Hulu subscription because that is the only place you can see it for now. Netflix/Marvel collaboration continues with a brand new series based off of everyone’s favorite vigilante. Jon Bernthal reprises his role as the tortured terminator of criminals from the second season of Daredevil. We’ve only seen the first few episodes of The Punisher so far, but they are pretty solid. We highly recommend taking time to check it out. If you are a Marvel fan, and you need to see all things Marvel-related, you might as well get this series over with. Unfortunately, it isn’t very good. There are a number of strange story decisions that we can only assume had to do with cost savings. The best part of the whole show is Lockjaw, and the show doesn’t feature enough of him to save it in our opinion. If you haven’t at least started watching this season, I’m not sure what you are waiting for. This holiday weekend would be a great time to re-visit the “Upsidedown”. Being a fan of the first season, this season will help solidify Stranger Things as one of your favorite shows. Check it out! The Flash series is consistently one of our favorite shows to watch on the CW. There are a few episodes for this season out already. We recommend checking out this season. We aren’t sure where this season will take us, but we think it will be a fun ride. If you prefer things on the big screen, and for some reason you haven’t seen these yet, we definitely recommend the latest Thor movie and the Justice League film. We think the new Thor film is awesome! The new Justice League gives us one of the better Superman scenes in recent years. We think they are both worth checking out!